The Church of God is not a cult. If you look up the definition of a cult in the dictionary it says that a cult is group of people that gather to worship so I guess every religion is a cult. Even 2000 years ago, followers of Jesus were considered a cult too. The rest of the definition of a cult, as stated above, can be subjective. The simplistic definition of a cult found in the dictionary does not quite provide a definitive answer. Thus the question then becomes, does the WMSCOG fit a more complex definition of a cult? “A group should not be considered a ‘cult’ merely because of its unorthodox beliefs or practices. Destructive cults are distinguished by their use of deception and extreme influence.”. 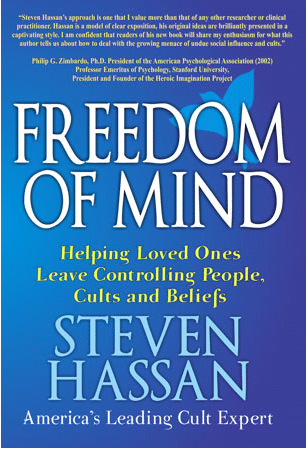 Steven goes on to explain that mind control is a tool that destructive groups use in order to manipulate members and create a new identity where the “locus of control” is no longer within the individual. Through his many years of research, Steven developed a tool called the BITE Model which is used in order to help determine if a particular group is a destructive mind control group. (For more info on Steve Hassan’s BITE Model click below to watch his lecture on Vimeo). In order for destructive mind control to be successful, the following four key elements need to be controlled: Behavior, Information, Thoughts, & Emotions. 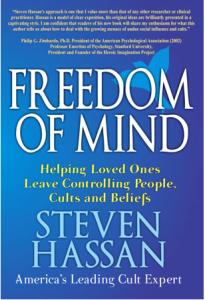 Let’s examine how each of these elements is controlled in order to determine whether or not the WMSCOG fits cult expert Steve Hassan’s definition of a destructive mind control group. I will use information that I obtained while speaking with both current and former WMSCOG members. I recognize that individuals’ experiences with the WMSCOG may differ, and I invite any current or former members to comment on the following analysis, and whether their experience was similar. I will now examine cult expert Steve Hassan’s BITE model in detail and compare it with my own and others’ experience with the WMSCOG. The blue text is taken from Hassan’s BITE model available online here. One former member told me that when she was involved in the WMSCOG, she rarely spent time with family and friends that were non-members because she was always so busy studying and preaching. I’ve also heard members say that they are told to avoid anyone trying to “speak against” the church because Satan will use the people closest to you to try to “kill your spirit”. Destructive mind control groups gradually pull members away from their support systems by keeping them excessively busy. A former member that I spoke with explained to me that she was always exhausted. While in the WMSCOG, she was encouraged to wake up at 5 am to pray every day and even received phone calls from other members to make sure that she was awake. During feast celebrations, members were required to attend 5 am and 7:30 pm services. Destructive cults keep their members sleep deprived so that they are not allowed to think clearly. Certainly in my own experience, sleep was considered an “idol” if it kept me from going to the WMSCOG. One woman told me that her husband would not go on vacation with her because all of the days off allowed by his job were reserved for feast days and preaching missions with the WMSCOG. She said that even if he did have the available time off, that he would only agree to go where there was another WMSCOG in the area. She also mentioned that he spent every day during the week at the church and would often arrive home after midnight. Neither was this was not particular to this woman’s husband alone, but in my own time in the WMSCOG, it was my impression that most members fell into this category. There were a few folks who did not partake of all the activities, but they were considered to have “less faith”. Where I attended the WMSCOG, they actually gave their a members a letter for their employers to request time off for religious activities. The letter stated that the employee would need approximately 10 days off a year to attend certain “feast days”. One former member told me that when he would go preaching with other members, they would represent themselves as a group of students, Bible study students, or students from the “Elohim Academy”. He said that he would never mention that he represented the WMSCOG because people would be less likely to listen to him if they had previously heard anything negative about the group. Has anyone that has come into contact with the WMSCOG been told up front that they believe that a man named Ahn Sahng Hong is the Second Coming of Jesus Christ, or that the mother in the Bible that they speak of is Zhang Gil Jah and that she is living in S. Korea, or how much time and financial commitment is required of members, or why the WMSCOG books are unavailable to the public? I once asked a current member if she had ever done any research on the Internet regarding the WMSCOG. She answered that this was strictly prohibited by “mother” (Zhang Gil Jah) because the Internet was the tree of knowledge of good and evil. When I asked how so, she explained that the tree of knowledge of good and evil caused Adam and Eve to experience death in the book of Genesis and members who researched the group on the Internet frequently ended up “spiritually dead” because they subsequently left the WMSCOG. For me, I wondered, if the Internet is the tree of knowledge of good and evil, then why does the WMSCOG have so many websites? By automatically calling their doctrine “the truth”, the WMSCOG discourages any critical questions. After all, who doesn’t believe “the truth” right? On preaching missions, if people did not listen to us, the members would say that they “did not want to hear ‘the truth'”, or that someone was “too arrogant to accept ‘the truth'”. –Adopt “loaded” language (characterized by “thought-terminating clichés”). Words are the tools we use to think with. These “special” words constrict rather than expand understanding. They function to reduce complexities of experience into trite, platitudinous “buzz words”. From my experience within the WMSCOG, outsiders that rejected the doctrine were automatically labeled as “arrogant”, “spiritually blind”, “not having spiritual eyes and ears”, and “spiritually dead”. I remember members mocking the rest of Christianity because they were “deceived” or “blind” and did not have the blessing of “knowing father and mother”. This seems like a perfect example of the “us vs. them” mentality that mind control groups use in order to create an elitist mentality among members within the group. –Thought-stopping techniques (to shut down “reality testing” by stopping “negative” thoughts and allowing only “good” thoughts); rejection of rational analysis, critical thinking, constructive criticism. I once asked an ex-member what he would do if he ever experienced any doubt about what he was taught, heard, or saw at the WMSCOG. He plainly stated that doubt was normal in the beginning but he was encouraged to immediately start praying to “father and mother” to stop satan from putting the doubt into his mind. My question is, what if that is God trying to tell you something? In a situation where mind control is successful, the leader is viewed as perfect and any doubts about the leader or the organization are viewed as weaknesses within the members. I remember having questions about Ahnsahnghong and the lack of evidence in his own writings of any claims of divinity. Instead of addressing my question directly, I was told that I needed to “study more”. Therefore, the problem was me and not the fact that I could not find a single instance where Ahnsahnghong ever claimed to be the second coming of Christ in any of his books that I had purchased at the WMSCOG bookstore. I asked a current member if she had read any literature on cults in order to determine for herself whether or not the group she belongs to is in fact a cult. She very quickly answered that she has no interest in any “worldly knowledge” or books written by people outside the church because she only has to look to the Bible (through the interpretation of the WMSCOG of course) for answers about the most important thing, which is her salvation. My question to her then was, “How does anyone determine if the group that they belong to is the right group?” If other groups like the Mormons or the Jehovah’s Witnesses could twist the Scriptures in order to lead people astray, how could members of those groups figure out if they are in a cult or not? Her answer was that she knew that she was in the right group because the WMSCOG “follows the Bible”. Couldn’t Jehovah’s Witnesses or Mormons give the exact same answer? Does that answer make any group right? Would another WMSCOG member like to comment on this? Guilt is one of the most powerful motivators that a destructive mind control group can use in order to produce obedient followers that can never do enough for the leader. I once asked a WMSCOG member why they put all of their free time every day after work into church related activities. The member explained that he realized the huge sacrifice that “father and mother made by coming to the earth to save us”. He went on to say that he needed to “do more, study more, and learn more” because their “sacrifice was so great” that he had to show how grateful he was by making sacrifices and letting go of his prior “sinful nature”. By his “sinful nature” he meant letting go of his prior interests, hobbies, and career aspirations. A person under mind control cannot visualize leading a positive and fulfilled life outside the group. I once asked a member if he ever envisioned himself leaving the group. He immediately answered “No… absolutely not”. I asked why and he answered that it was not an option because he would “risk getting into a car accident, becoming ill, or even physically dying”. Since he wouldn’t be observing the Passover, Sabbath, and other feasts, he would lose his protection from disasters and ultimately his salvation. Are there any current WMSCOG members that disagree with this? I certainly understand that everyone’s experience in any organization can vary greatly. I do not know how the WMSCOG functions as an official organization, or in other places. I can only speak from my and other member’s own personal experience, what I witnessed, and was involved in. Based on my experience, if I measure the WMSCOG against cult expert Steve Hassan’s BITE Model, each of the components Hassan lists are present within their organization. world mission church of god is a cult that can break family apart. The teachings of the movement mark it as, theologically, a cult of Christianity. Sociologically the movement has cult-like elements as well. Earlier one of members of wmscog invite me on their service, I told him no thanks because I already heard enough all the stuff on their last service and i told him that I will never turn back on my on religion and beliefs,he keeps saying that devil is using humanity and all religions are evil which I disagree, and then he keeps texting about the scriptures which there is a lot of contradiction on it and I told him that not all human were being used by the devil and not all religion are evil and also I told him that God create us to have our own free will to change our beliefs but he is a little bit stubborn and still sending me some passages, I dont know if he is trying to control me because if he is its not really working because I believe our God the Father and our lord Jesus. I have recently been baptized into the Church of God, myself my husband and my 2 kids, at the moment i have been going to Bible study sessions where my husband and i study together with the Pastor. I have not been taught about Ahn Sung Hong so im not quite sure what to think, i have asked them who the Father and Mother is but they said that is another lesson me and my husband will learn together. I was really happy to join this church because we study straight from the Bible but im quite shocked to have found this website and im also really not sure about who this ahn sung hong is that they keep mentioning in prayer, i thought he was just founder of there church but now im hearing he is the 2nd coming Christ and im very confused now, i dont know what to do. Someone please help me, the day i became a born again Christian i asked God to help me with my journey and the next day the WMSCOG showed up at my door wanting to teach and help me, i thought it was a sign from God or something cos it was so coincidental now im just not so sure if they were sent as a sign to help me or a test to overcome false teachings from people. Please help, im very confused and so lost. i am very sorry to hear that you were not better informed about who Ahn Sahng-Hong is. He was a Korean man who split off from the SDA movement to form his own flavor of church. He never claimed to be Jesus, but the WMS claims he was. The WMS themselves are a split off of the NCPCOG ( http://www.ncpcog.co.kr ). The “mother” is a Korean woman named Zahng Gil Jah. This sort of new religion seems very common in Korea. I am sorry you have been misled by these false prophets. The Lord is so good that He brings great good out of bad. While this religion is blasphemous to Our Lord Jesus Christ, you can certainly return to Him, ask His forgiveness, and use this experience to seek more closely after the truth of His church. If you have any other questions I would be happy to answer them. I am a Catholic Christian. I have only just begun studying about this group as I have begun to encounter its members. I, too, am Christian. Scripture is essential, but I would remind you that even the devil quotes scripture (as he does in Luke 4 referencing the Psalms while he tempts Jesus). Quoting scripture, as this group does, does not necessarily mean they are of God. They take many, if not all, verses they use COMPLETELY out of context. I encourage you to do some study on your own, without their influence. Read the context of the scriptures they are quoting, and you will see what the scripture is actually saying. Always remember, the scriptures teach us that Jesus comes to free, not to bind. Sure we have rules we should abide by (just like children do from their parents), but He will always allow us to make that choice freely. A group which leads by fear, force or manipulation/deception is not of God. And that includes any group that is not willing to share with you their true teaching before you commit. I can only imagine what a trying time this is for you! I will keep you in my prayer! Notice that “is never to die again” and “cannot die again” , it shows that the second coming of Christ will not die again. But what happened Ahn Sung Hong died. HE DIED, THEREFORE HE IS NOT THE SECOND COMING OF CHRIST. I have a friend stuck in WMSCOG and was brained washed. She told us about the second coming of Christ and me and my group of friends went to find out more. And we read the bible and we came across Romans 6:9 and there it is we got our answer. this verse is hard because in revelation it says there is a second death. they say the death in Romans 6:9 is the spiritual death (2nd death) in Revelation. They say Christ’s spirit cannot die. Read the paragraph it is talking about His resurrection. Saying if God’s people die their spirit will not die. So I really want to leave the church but they have such good explanations for everything. If you really studied the Bible you would NOT be studying in this group! You also would NOT be asking other to do so! Please read the Bible outside of the influence and direction of the WMS. View it with new eyes and read what it REALLY says and the context which it is speaking about. You will find that most of the WMS teachings don’t stand up when compared to Gods Word. When the contradictions become apparent, throw that WMS teaching into the garbage. That is where it belongs if it does not measure up to the Word of God. I talked with a member today, and he gave me lesson one and lesson two. Lesson 1 taught that God’s redemptive plan has been divided into 3 eras over a period of 6000 years. Lesson 2 talked about Christ coming in the clouds which the member said meant “body.” When I asked him about god the mother and the second coming of Christ (which he believes already happened), he replied that I was not ready to hear that because he hadn’t explained the prophecies concerning the second coming. I might talk with him again next week, but this time I hope to be a little bit more prepared. DON’T!!!! I REPEAT, DON’T!!!! THIS BS CULT IS SPREADING LIES TO YOU AND AS SOON AS YOU HEAR THEM, YOU MIGHT FIND YOURSELF RELUCTANTLY AGREEING WITH THEM EVEN WITHOUT THOUGHT! THEY ARE THAT CUNNING AND DECEPTIVE! I ALMOST FELL TO THEIR SCHEMES BUT THANKFULLY, MY FAMILY MOVED OUT OF THE COUNTRY TO PREVENT ME FROM BEING DECEIVED FROM THEM!!!! GET OUT OF THEIR SIGHT NOW!!! I REPEAT! GET OUT OF THEIR SIGHT NOW AS SOON AS POSSIBLE!!!!! Judge for yourself what is right. When arrogance, anger, discontent, complaint, hate, and violence are supported on a website like this ask yourself if that could quite possibly be from God. The traits listed above are far from the teachings of true God. All I see in here is typing in all caps and people saying “Stay out of the Church of God” but it is funny because they never tell you where to go or why that church is the “correct” church. By these traits you are heaping more wrath upon yourselves than you realize. Do not follow the rules of man and take solice in the glory a man bestows on himself. Yet be firm in your faith and test everything to find whether it came from God the creator of all, or man which is the creator of Judge for yourself what is right. When arrogance, anger, discontent, complaint, hate, and violence. After a week of participating in Bible study at the church, I was baptized in the name of the Holy Spirit, Ahn Sahng-Hong, and I entered my name and address into their “Book of Life.” As soon as I Wiki’ed the WMSCOG and realized who they were worshiping, I promptly texted my tutor and said I did not want to continue attending Bible study with her. She begged me to meet her for one more session to show me some verses from the Bible, and “for the sake of our friendship.” I said I would think about it over the next few days. A few days later, she texted me in the morning asking if I wanted to meet her that night. I didn’t reply because I was still thinking about it, so what did she do? She took my address from the Book of Life and SHE SHOWED UP AT MY HOUSE UNANNOUNCED, saying “I was worried because you didn’t answer my text.” WTF?! Now that I’ve read on this site about how the members are required to recruit ten “talents” to get more tithing to the church, I’m even more pissed that she came to my house uninvited. they were sent as a test to open your eyes so that you never again fall for the devil’s trap. everyone who has been tricked into joining this satanic cult was approached when they were looking for God, for his answers, signs, and guidance—so it is no coincidence that the devil runs to them to lure them away from our one and true God and his son Jesus Christ. i hope that you’re no longer trapped in this cult. Get out of there!!! talk to God!!! Repent and he will receive you. This is so ridiculus!!!!!! The B.I.T.E model is more influencial then the Holy Bible? first of all, do not believe anything the wms have to say about “sake of a friendship”, there is no such thing as friendship in wmscog, if you are not deemed profitable enough for them or shown signs that you are not that easy to coax or dupe… they WILL leave you just like that. You know I eitn deaconess congratulating a sister for leaving college and her scholarship to preach. Oh yeah, my spouse still attends and believes so occasionally I will go. We have done so much for that church; we have given rides to members 30 miles out of the way, we have spent hundreds of dollars on food for the members, we have spent hundreds of dollars on lawn services, equipment, plants – yet recently our vehicle became disabled, okay? This past week, we were told by the church leader that they would call on monday to let us know if the church was open. NO call, we saw though, that another member was with the churhc leader preaching. We called the church leader 17 times this week. No answer, no return all. Today we were contacted by a member, whom we’ve taken home countless times (20 minutes out of our way) and he said he would come and get us in the morning for Sabbath day. He called back this evening and said that – he couldn’t say why – but the church leader had JUST (MINUTES) CONTACTED HIM directed to not come and get us. We immediately contacted the church leader … no answer. we called the member back, he refused to tell us why. We contacted 7 other members, … no answer. No call back. These are members that have told us that the loved us like physical brothers and sisters. But when physical hardship came our way and we could no longer afford to give them every minute and dollar to them. Its so sad really. I forgot to say, (this was my main purpose in writing.) We had a new member in november get an $8,000 student loan. I witnessed with my own eyes, her sit with the church leaders and plan how to use the money. She was very out spoken about not planning to attend school. She bout a used lexus (which broke down after 4 months) and she spent alot on shoes and food for church. Now, … shes being evicted. This is true. if you say a bad thing about a leader you are kicked out, if you have a good income you become a deacon. Lol. Even if you say bad things about the leaders. This is literally true. When I first ‘came in to the truth,’ we made about $7000 gross monthly income. Now our particular office church there were less than 20 regular members and of them, many were students, unemployed, or worked very low paying jobs. At that time, many of us were studying the sermon book at about the same rate. I was no further than anyone in fact, I was a couple of subjects behind other members. I was asked to become the announcer and begin teaching new comers. within a few months, I began to ‘work in the gospel more diligently’ because it was 2012 — and you know what was taught back then. In fact I actually resigned from position. I focused solely on the gospel work. We had basically zero income. But we were at Zion daily: preaching, praying, and studying. Guess what happened? Yeah, they removed me from that position. Fast forward three years. I have that income again – or the potential to have that income again – and I am told I would make such a great gospel worker. Please do this please do that. Do you know what happened? I lost my job. and then, (it’s boarder-line comical) they won’t even answer my calls. The saddest part for me though: I kinda believe a lot of whats taught and since I can no longer tell the real from the scam it makes me (like many others) not have a desire to want to attend any church or know go. It makes me have a more clear understanding about the agnostic. Futureexmember, welcome. Please post on the forum here so more people can see your testimony. You have a compelling story. I am very sorry that the wmscog has soured you on any religion, but at least you are seeing what is wrong with this one. Later you will start, hopefully, to catch on to the inconsistencies in their teachings. You already see what I’ve seen: The words in this church rarely match the actions. The members are victims, not bad people. They are victims and are being taken advantage of. I know what you say is true. just wait for the judgement to come. & we’ll see. ’cause only few will be saved and it will be those who are in the side of The Truth. Judgement will come very sure and certain, yet many people are with WMSCOG, they don’t have to wait for judgement because they are already condemned to a very grievous penalty. If the god who is subject to worship is not the GOD of Israel, in no way that people can be guided to true salvation and paradise. Worshiping a dead or living person is actually paganism. Never that the Bible teaches such. Hi. I just want to share my experience as I was approached by a few Elohim Academy students about 2 weeks ago. As I was walking on some street, they approached me and one of them handed me a Tablet (as in electronic device) and asked me to answer 7 questions in their survey. As I answer the questions, some of the other members of the Academy were preaching the gospel to an unbeliever next to me. I knew the person was an unbeliever as she answered “no” to all the questions they asked her about — like whether or not she knows the existence of Mother God and Father God etc..
1. Do you have a religion? 2. Do you believe in Jesus Christ? 3. Do you know about the Holy Trinity, Father, Son and the Holy Spirit? 4. Do you believe in the second coming of Christ? 5. Have you heard of Mother God? Then two of them (college or university girls) showed me a video about water of life and the water can only be given by God, and specifically Mother God. they then referred me to Revelation 22:17 which says that “the Spirit and bride say, “Come!”and let the one who hears say….. let the one who wishes take the free gift of water of life.” It’s a video full of catastrophic events and saying only God can give water of life. But I didnt rebuke them, I just listen to what they all have to say.. So, I went back home after that and did my research. so here’s what I found, an article talking how a person rebukes the WMSCOG’s members. Now, back to the Revelation 22:17. The verse mentions about the bride. I asked them, who is the bride? they tole me immediately the bride is the Mother God. But in the video I heard it was said, “the bride is the CHURCH” ! Their own video contradicts the message they are conveying if I have not mistaken what the video said. Anyway, it’s for you to decide whether or not to believe in the Elohim (which means Gods)– Father God AND Mother God concept. WMSCOG uses history & science to prove everything they believe in…[this comment has been moved to the forum for further discussion]. My ex is involved in this cult and trying to brainwash my 10 year old daughter. It’s crazy the things they [and she] do and say to children and the guilt they use. As I’m reading this, I realized that many of the things she was saying to me are the exact same things you are quoting them as saying to discourage discourse and are obviously just regurgitated immediately, to defend their beliefs. You’re absolutely right and correct. And not only their websites increasing but also lots of blogsites including that Cult Research Center which is not actually a research center. Internet is an excellent medium for promotions and advertizing. Too bad if people fall to WMSCOG traps. Anyway, let’s join hands in keeping people well informed of the dangers of this destructive organization. It’s the least we can help. Hello! Uhm, actually this afternoon, two young student korean girls came to me, asking me to do a Christianity survey and they suddenly talked about God being the mother and when I asked them where were they from, they said Elohim Academy. So they started talking to me about Jerusalem, bride and all that stuff, even showing me the bible verse and when they were speaking, I had a bad feeling ’bout them but I kept quiet and let them speak. So after for a few minutes, I told that I had to go and they asked me if they can call me and talked to me about this “sharing’ again (I accidentally gave them my first name and hp number, before they preached to me about God being the mother). After when I reached home, I googled their Academy and about WMSCG from the leaflet they gave me and I’m kind of shocked. Many people were saying how they are cults and all. It’s creepy! And I even gave my name and hp number to them! Will they use my personal details and do crazy stuff?! Like I dunno, what do cults do when people don’t want to be part of them? D: Will they curse me?! Oh gawd. @Asheer .. I wanna ask uou a question. Do you believe that persons like you can be gods? Do you believe these man-appointed gods created the heavens and the planets and all of the solar system? Do you really know who are these korean people? Have you read the Bible in its entirety and not just by cherry-picking some verses and then give meanings and assumed interpretations? This site provides you all the TRUTHS about WMSCOG. The organization was even declared as a dangerous and destructive cult by their own government in South Korea. If I were you, I would gonna leave right away for WMSCOG is really dangerous. Why I say this? It’s because there is no true salvation in it but instead leading you to hell while you aren’t aware and at the same time squeezing your energy and hard earned money. They are a cult!!! they were sent as a test to open your eyes so that you never again fall for the devil’s trap. everyone who has been tricked into joining this satanic cult was approached when they were looking for God, for his answers, signs, and guidance—so it is no coincidence that the devil runs to them to lure them away from our one and true God and his son Jesus Christ. i hope that you’re no longer trapped in this cult. Get out of there!!! talk to God!!! Repent and he will receive you. I’ve been involved with them for 3 years. It’s so hard to leave. And even though I have several doubts and have recently recorded contradictions (which I plan to post on this site) the hardest part is that they make you feel like its the only truth and all else is false. It’s so hard. I feel guilty leaving, because I feel like God “clearly” teaches opposite of what “babylon” teaches.I feel like, how would it be possible to go to one of theirs. But, I think the best thing to do is seperate from them ling enough to think clearly. Being around them constantly fogs your mind. just leave the best you can, for a few weeks or a month, and then see. You give good advice, Future ex: Mind control only works if it is applied consistently. Getting away to clear your head is the first and most important step. Then looking at the Bible for yourself without their direction. Let God speak to you. My poor loved one in there can’t hear God anymore. All he can hear is the church leaders in his ear. The distance from them makes room for God’s voice. You are supposed to have a personal relaltionship with Jesus, not a group relationship. Let Him speak to you personally. Give Him a chance to do that. Good luck. As I said before, please post on the forum. Here is good, but you will reach more and get more people to respond with good advice if you move your discussion there. If you don’t want to, then just keep posting here. Wherever you feel comfortable is good. Leslie, read all you can on this site. There is so much good information that can help you to prove them wrong. It isn’t really hard to do. It just takes some reading and an open mind that is not under undue influence. From talking to former members, I can assure you that you will not be ruined if you come out of the wms. Former members I have talked to have said that once they were out and they examined what they were told, they could not believe they were taken in by this group. Good luck. The best way to get the help you need is to ask your questions at this forum, instead of the one you are using now…. I want to share something with you. It may help. When people are thinking about leaving this group it is usually fear that keeps them from leaving. Fear is only a emotion! What fear really stands for is False Evidence Appearing Real! F.E.A.R. Don’t live in fear and feel free to share this idea with your BF. You never know what it will be that releases the grip over a person. It could be something as simple as this. I see people selling their homes and property nowadays to give everything to the pastor for house churches because Zhang said the end day is September this year. To me, something’s not right. Why doesn’t she use the tithes? She said do not withhold your possessions or you won’t go to heaven. The members are selling everything. ??? Weird. She’s already making so much profit off the tithes because she only pays the big church buildings mortgage with the tithes. Every other bill is paid by the members. Leaders of the COG prove where the tithes go and that this is not a for profit organization. We had a member go to see Mother in April. In May, and I have proof, He attempted to use fraud to steal almost $3000 from my business. He is the Church leader. How can a church leader, go and be with the living God. Come back moved. And then Steal $3000 to do the gospel work? That really hurt my faith. Wow! Please do whatever you can to document this. It should be turned in to someone in authority because it is actually something that CAN be proved with documentation. Good luck. Why September, Lisa? What is the explanation on that date? There have been so many different dates that were the end. At the same time they were telling people in Chicago the end was 2012, they were telling young recruits in Seattle that the end would be in 2018. I also call for transparency on the finances of the wmscog. It is their most closely guarded secret. They talk about biblical secrets that only they know, but really, it is financial secrets that only they know. September 23rd (day of Atonement) the the date Mother gave at the general assembly this year, the say this is the date Father comes to takes us to heaven. This is because the church was established on the day of Atonement 50 dears before. Therefore it is the year of Jubilee. Leslie is that what they are also teaching at your bf’s church? Everyone is selling their homes cars etc to give to the pastor to make make house churches. They say its a great movement. What’s gonna happen when they wake up stretching and yawning on September. 24th? It’s a one day at a time kind of thing Leslie. You are just going to have to plan on doing something else one of these Saturdays and you and your boyfriend just go and do it! Don’t ask for permission or tell them that you’ll be gone just go and do it. I don’t suggest this out of rebellion but as an act of freedom. Jesus came to set the captives free not enslave us. You are not going to fall out of the truth or go to hell for stepping away from this group. You already know that there is something very wrong with them. You and your boyfriend just simpily need to step away, take some time to let your head clear, and then research and decide what’s best at that point. God gave you a brain that He expects you to use but not only that He gave you free will. Don’t be enslaved by this group anymore. Once you step away don’t let them hassle you into coming back. Cut off contact for a while. I would suggest atleast three months. At that time do your research and if they are still willing to talk to you see if their doctrine is worthy of Gods Word. See for yourself if their teachings are full of flaws. Help us free some of the other people if you should choose to. If not then just find some better ways to fill your time. They will say what they did when the end of the world didn’t happen in 2012: “Mother had mercy because of our prayers”, or “No when we said the end of the world was going to be in 2012 we actually meant something else.” Or, my favorite, “Some people were incorrectly preaching that the world was going to end in 2012.” So funny that they ALL seemed to be incorrectly preaching about that. Apparently no one in that church knows exactly what they mean when they say something. And then they will all accept a lame excuse AGAIN. I’m very upset with this group. My mother is elderly and has several medical conditions that require some special attention. But this church is telling her who to hang out with, what, where, and when to eat. And what she can and cannot do with her family members. My mother’s diabetes require her to eat at certain times and eat the proper food. How dare they have the right to control that. When she told me she found her spirituality again, I was happy for her. But when all of this crazy nonsense started happening the more and more she was involved, It sounded just way too off. People to prey on those who seek comfort, aren’t human! Wait a minute. Steve Hassan? The self-proclaimed cult expert? No where in the world can one get a degree in “cults” or have expertise in cults. Especially as a “self-proclaimed” one. That’s straightforward logic, since I’d like to find credibility if a group is actually a cult from someone who can RELIABLY make that judgment. Ridiculous. You might as well say that The Beatles are a cult. Hassan Hoax, draw your own conclusions. I could care less what title you’d like to or prefer not to use, but your logic is flawed. Additionally, it aggravates me when I hear members regurgitating the same “explanations”. Think for yourself! You don’t trust anything with Hassan’s name stamped on it because he said He’s a cult expert? I challenge you to pick up a book about social psychology. Read it. You don’t need a degree to become an expert in something! Think! Read! To be an EXPERt you should have training or EXPERience. I’m not trying to come down on you. I’m sorry. Please stop and before you post, think about what you are saying. Don’t be too worried to think.